Former offenders face barriers to re-entering the labor market after release from prison, and these challenges appear to have gotten worse over the past two decades. The stigma of a criminal record and professional licensing requirements that bar ex-offenders can make re-entry difficult, and the experience of incarceration itself can interrupt individuals’ career progression. But even before entering prison, offenders often struggle to gain formal employment and tend to have low levels of educational attainment. Offenders, their communities, and our state’s employers all have a stake in ensuring that former inmates successfully re-enter society as productive members of our workforce. North Carolina’s Department of Public Safety (DPS) is charged with providing educational opportunities to the incarcerated, and works closely with partner organizations to offer programming that improves the employment prospects of offenders under its supervision. DPS is a sometimes-overlooked but crucial link in North Carolina’s “workforce system”—a collaboration between several state agencies, overseen by the NCWorks Commission, that aims to help workers succeed in the North Carolina economy. DPS offers numerous opportunities for inmates to enhance their work experience, knowledge, and skills, depending on the attributes of individual offenders and the capacity of their prison facilities. Most inmates are assigned to jobs—including (but not limited to) unit jobs such as food service, maintenance, and janitorial work—helping them to stay active and improve their on-the-job skills while incarcerated. Most inmates (whether or not they’re assigned to a job) are also assigned to a correctional program, including education programs administered in partnership with local community colleges—ranging from basic reading, writing, and computation skills to advanced vocational and post-secondary academic programs.1 Finally, inmates may participate in workshops provided by the state Commerce Department’s Division of Workforce Solutions (DWS) that assist them with registering on NCWorks Online, our state’s official portal for searching for jobs and connecting jobseekers with employers. were neither employed nor in prison at any time during the year. This analysis does not demonstrate whether workforce programs offered to offenders are effective. For example, inmates that receive services might have started off being more (or less) employable than those who don’t, and this analysis does not control for such differences. However, we do show that participation in a workforce program is associated with improved employment outcomes. We start by focusing on a cohort of 22,160 offenders released from prison in 2012. Over two-thirds (67%) of this cohort were assigned to a job or received a workforce service from DPS, DWS, or community colleges while incarcerated and within a year before release.3 Among this group, over a third (35%) obtained employment (and did not return to prison) in North Carolina during the first year following release, compared to less than a quarter (23%) of the comparison group. These individuals were also less likely to have returned to prison (without obtaining employment) after release (7%) than those in the comparison group (13%). As mentioned earlier, these findings should not be interpreted as demonstrating the effectiveness of workforce programs. These programs might be less effective (or even more effective) than represented here, since we are not controlling for differences in the attributes of individuals who receive these services. 1In this article, we focus on academic and vocational education programs provided through DPS and the North Carolina Community College System, as these are most directly related to workforce development. We omit other categories of service, such as substance abuse programs, which may improve employability but may not directly result in knowledge or technical skill gains. 2We calculate wages in the four quarters after release from state prison, and treat any wage-earning during this year as an indication of employment in NC. We also determine whether individuals return to prison in NC during this period. Wage data in the CFS are based on state unemployment insurance (UI) tax records from employers, and thus may omit earnings from federal government employment, self-employment, “under-the-table” jobs, and other work not covered by state UI laws. Around 3% of released prisoners are released from more than one period of incarceration in a given year; for these persons, we include only the last release of each year. 3Workforce services that are currently provided by the Division of Workforce Solutions were provided by two different state agencies prior to July 2013 – the Employment Security Commission, and the NC Commerce Department’s Division of Workforce Development. 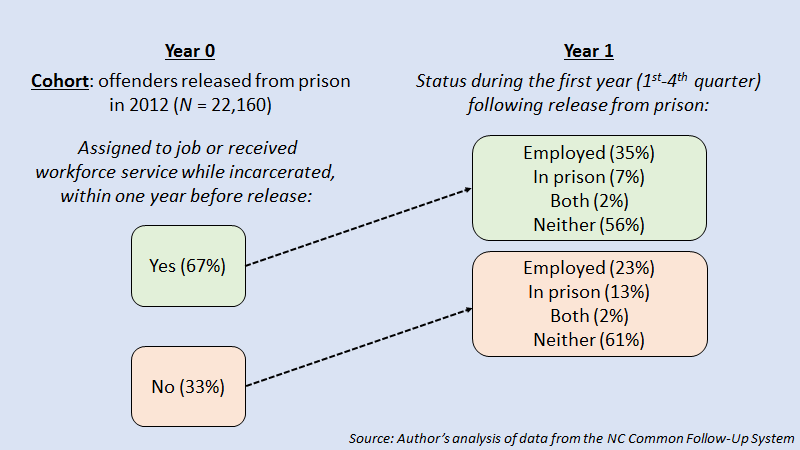 415% of both groups fell into either the “in prison” (but not employed) or “both” (imprisoned and employed at some point during the year) categories during the second year after release. 5Our findings are robust to the time period examined—offenders released during earlier years saw similar outcomes following program participation. Moreover, the outcomes of those receiving services in the year following release remain much the same when we examine only those persons who did not return to prison the year after their initial period of incarceration.